This article is about the health effects of non-ionizing radiation. For the health effects of ionizing radiation, see radiation poisoning. Electromagnetic radiation can be classified into two types: ionizing radiation and non-ionizing radiation, based on the capability of a single photon with more than 10 eV energy to ionize oxygen or break chemical bonds. Ultraviolet and higher frequencies, such as X-rays or gamma rays are ionizing, and these pose their own special hazards: see radiation and radiation poisoning. The electric currents that flow through power sockets have associated line-frequency electromagnetic fields. Various kinds of higher-frequency radiowaves are used to transmit information – whether via TV antennas, radio stations or mobile phone base stations. By far the most common health hazard of radiation is sunburn, which causes over one million new skin cancers annually. Very strong radiation can induce current capable of delivering an electric shock to persons or animals. It can also overload and destroy electrical equipment. The induction of currents by oscillating magnetic fields is also the way in which solar storms disrupt the operation of electrical and electronic systems, causing damage to and even the explosion of power distribution transformers, blackouts (as occurred in 1989), and interference with electromagnetic signals (e.g. radio, TV, and telephone signals). Extremely high power electromagnetic radiation can cause electric currents strong enough to create sparks (electrical arcs) when an induced voltage exceeds the breakdown voltage of the surrounding medium (e.g. air at 3.0 MV/m). These sparks can then ignite flammable materials or gases, possibly leading to an explosion. This can be a particular hazard in the vicinity of explosives or pyrotechnics, since an electrical overload might ignite them. This risk is commonly referred to as Hazards of Electromagnetic Radiation to Ordnance (HERO) by the United States Navy (USN). United States Military Standard 464A (MIL-STD-464A) mandates assessment of HERO in a system, but USN document OD 30393 provides design principles and practices for controlling electromagnetic hazards to ordnance. On the other hand, the risk related to fueling is known as Hazards of Electromagnetic Radiation to Fuel (HERF). NAVSEA OP 3565 Vol. 1 could be used to evaluate HERF, which states a maximum power density of 0.09 W/m² for frequencies under 225 MHz (i.e. 4.2 meters for a 40 W emitter). The best understood biological effect of electromagnetic fields is to cause dielectric heating. For example, touching or standing around an antenna while a high-power transmitter is in operation can cause severe burns. These are exactly the kind of burns that would be caused inside a microwave oven. This heating effect varies with the power and the frequency of the electromagnetic energy. A measure of the heating effect is the specific absorption rate or SAR, which has units of watts per kilogram (W/kg). The IEEE and many national governments have established safety limits for exposure to various frequencies of electromagnetic energy based on SAR, mainly based on ICNIRP Guidelines, which guard against thermal damage. There are publications which support the existence of complex biological effects of weaker non-thermal electromagnetic fields (see Bioelectromagnetics), including weak ELF magnetic fields and modulated RF and microwave fields. Fundamental mechanisms of the interaction between biological material and electromagnetic fields at non-thermal levels are not fully understood. A 2009 study at the University of Basel in Switzerland found that intermittent (but not continuous) exposure of human cells to a 50 Hz electromagnetic field at a flux density of 1 mT (or 10 G) induced a slight but significant increase of DNA fragmentation in the Comet assay. However that level of exposure is already above current established safety exposure limits. Fluorescent light bulbs and tubes internally produce ultraviolet light. Normally this is converted to visible light by the phosphor film inside a protective coating. When the film is cracked by mishandling or faulty manufacturing then UV may escape at levels that could cause sunburn or even skin cancer. Blue light, emitting at wavelengths of 400–500 nanometers, suppresses the production of melatonin produced by the pineal gland. The effect is disruption of a human being's biological clock resulting in poor sleeping and rest periods. While the most acute exposures to harmful levels of electromagnetic radiation are immediately realized as burns, the health effects due to chronic or occupational exposure may not manifest effects for months or years. High-power extremely-low-frequency RF with electric field levels in the low kV/m range are known to induce perceivable currents within the human body that create an annoying tingling sensation. These currents will typically flow to ground through a body contact surface such as the feet, or arc to ground where the body is well insulated. Shortwave diathermy heating of human tissue only heats tissues that are good electrical conductors, such as blood vessels and muscle. Adipose tissue (fat) receives little heating by induction fields because an electrical current is not actually going through the tissues. Apart from some suspicion that the electromagnetic fields emitted by mobile phones may be responsible for an increased risk of glioma and acoustic neuroma, the fields otherwise pose no known risk to human health. This designation of mobile phone signals as "possibly carcinogenic" by the World Health Organization (WHO) (e.g. it's IARC, see below) has often been misinterpreted as indicating that of some measure of risk has been observed – however the designation indicates only that the possibility could not be conclusively ruled out using the available data. In 2011, International Agency for Research on Cancer (IARC) classified mobile phone radiation as Group 2B – possibly carcinogenic (not Group 2A – probably carcinogenic – nor the dangerous Group 1). That means that there "could be some risk" of carcinogenicity, so additional research into the long-term, heavy use of mobile phones needs to be conducted. The WHO concluded in 2014 that "A large number of studies have been performed over the last two decades to assess whether mobile phones pose a potential health risk. To date, no adverse health effects have been established as being caused by mobile phone use." Recent technology advances in the developments of millimeter wave scanners for airport security and WiGig for Personal area networks have opened the 60 GHz and above microwave band to SAR exposure regulations. Previously, microwave applications in these bands were for point-to-point satellite communication with minimal human exposure. Radiation levels in the millimeter wavelength represent the high microwave band or close to Infrared wavelengths. Infrared wavelengths longer than 750 nm can produce changes in the lens of the eye. Glassblower's cataract is an example of a heat injury that damages the anterior lens capsule among unprotected glass and iron workers. Cataract-like changes can occur in workers who observe glowing masses of glass or iron without protective eyewear for many hours a day. Another important factor is the distance between the worker and the source of radiation. In the case of arc welding, infrared radiation decreases rapidly as a function of distance, so that farther than three feet away from where welding takes place, it does not pose an ocular hazard anymore but, ultraviolet radiation still does. This is why welders wear tinted glasses and surrounding workers only have to wear clear ones that filter UV. Moderate and high-power lasers are potentially hazardous because they can burn the retina of the eye, or even the skin. To control the risk of injury, various specifications – for example ANSI Z136 in the US, and IEC 60825 internationally – define "classes" of lasers depending on their power and wavelength. Regulations prescribe required safety measures, such as labeling lasers with specific warnings, and wearing laser safety goggles during operation (see laser safety). As with its infrared and ultraviolet radiation dangers, welding creates an intense brightness in the visible light spectrum, which may cause temporary flash blindness. Some sources state that there is no minimum safe distance for exposure to these radiation emissions without adequate eye protection. Short-term exposure to strong ultraviolet sunlight causes sunburn within hours of exposure. Ultraviolet light, specifically UV-B, has been shown to cause cataracts and there is some evidence that sunglasses worn at an early age can slow its development in later life. Most UV light from the sun is filtered out by the atmosphere and consequently airline pilots often have high rates of cataracts because of the increased levels of UV radiation in the upper atmosphere. It is hypothesized that depletion of the ozone layer and a consequent increase in levels of UV light on the ground may increase future rates of cataracts. Note that the lens filters UV light, so once that is removed via surgery, one may be able to see UV light. Prolonged exposure to ultraviolet radiation from the sun can lead to melanoma and other skin malignancies. Clear evidence establishes ultraviolet radiation, especially the non-ionizing medium wave UVB, as the cause of most non-melanoma skin cancers, which are the most common forms of cancer in the world. UV rays can also cause wrinkles, liver spots, moles, and freckles. In addition to sunlight, other sources include tanning beds, and bright desk lights. Damage is cumulative over one's lifetime, so that permanent effects may not be evident for some time after exposure. Ultraviolet radiation of wavelengths shorter than 300 nm (actinic rays) can damage the corneal epithelium. This is most commonly the result of exposure to the sun at high altitude, and in areas where shorter wavelengths are readily reflected from bright surfaces, such as snow, water, and sand. UV generated by a welding arc can similarly cause damage to the cornea, known as "arc eye" or welding flash burn, a form of photokeratitis. 1 2 3 Cleaver JE, Mitchell DL (2000). "15. Ultraviolet Radiation Carcinogenesis". In Bast RC, Kufe DW, Pollock RE, et al. Holland-Frei Cancer Medicine (5th ed.). Hamilton, Ontario: B.C. Decker. ISBN 1-55009-113-1. Retrieved 2011-01-31. ↑ "Solar Storms and You: Human Impacts". 1 2 "Acquisition Safety - Radio Frequency Radiation (RFR) Hazards". Naval Safety Center - United States Navy. Retrieved 2014-07-30. 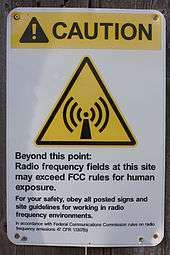 ↑ "Standard for Safety Level with Respect to Human Exposure to Radio Frequency Electromagnetic Fields, 3KHz to 300GHz". IEEE Std. IEEE. C95.1-2005. October 2005. ↑ International Commission on Non-Ionizing Radiation Protection (April 1998). "Guidelines for limiting exposure to time-varying electric, magnetic, and electromagnetic fields (up to 300 GHz)" (PDF). Health Physics. 74 (4): 494–522. PMID 9525427. ↑ Delgado JM, Leal J, Monteagudo JL, Gracia MG (May 1982). "Embryological changes induced by weak, extremely low frequency electromagnetic fields". Journal of Anatomy. 134 (3): 533–51. PMC 1167891 . PMID 7107514. ↑ Harland JD, Liburdy RP (1997). "Environmental magnetic fields inhibit the antiproliferative action of tamoxifen and melatonin in a human breast cancer cell line". Bioelectromagnetics. 18 (8): 555–62. doi:10.1002/(SICI)1521-186X(1997)18:8<555::AID-BEM4>3.0.CO;2-1. PMID 9383244. ↑ Aalto S, Haarala C, Brück A, Sipilä H, Hämäläinen H, Rinne JO (July 2006). "Mobile phone affects cerebral blood flow in humans". Journal of Cerebral Blood Flow and Metabolism. 26 (7): 885–90. doi:10.1038/sj.jcbfm.9600279. PMID 16495939. ↑ Binhi, Vladimir N (2002). Magnetobiology: underlying physical problems. Repiev, A & Edelev, M (translators from Russian). San Diego: Academic Press. pp. 1–16. ISBN 978-0-12-100071-4. OCLC 49700531. ↑ Focke F, Schuermann D, Kuster N, Schär P (November 2009). "DNA fragmentation in human fibroblasts under extremely low frequency electromagnetic field exposure". Mutation Research. 683 (1–2): 74–83. doi:10.1016/j.mrfmmm.2009.10.012. PMID 19896957. ↑ Mironava, T.; Hadjiargyrou, M.; Simon, M.; Rafailovich, M. H. (20 Jul 2012). "The effects of UV emission from compact fluorescent light exposure on human dermal fibroblasts and keratinocytes in vitro". Photochemistry and Photobiology. 88: 1497–1506. doi:10.1111/j.1751-1097.2012.01192.x. ↑ Nicole, Wendee (October 2012). "Ultraviolet leaks from CFLs". Environ Health Perspect. 120 (10): a387. doi:10.1289/ehp.120-a387. PMC 3491932 . PMID 23026199. ↑ "Exposure to 'white' light LEDs appears to suppress body's production of melatonin more than certain other lights, research suggests". ScienceDaily. ↑ "IARC classifies radiofrequency electromagnetic fields as possibly carcinogenic to humans" (PDF) (Press release). 2011-05-31. Retrieved 2011-08-01. ↑ Boice JD Jr; Tarone RE (2011). "Cell phones, cancer, and children". Journal of the National Cancer Institute. 103 (16): 1211–3. doi:10.1093/jnci/djr285. PMID 21795667. ↑ "IARC classifies radiofrequency electromagnetic fields as possibly carcinogenic to humans" (PDF). press release N° 208 (Press release). International Agency for Research on Cancer. 31 May 2011. Retrieved 2 June 2011. ↑ "Electromagnetic fields and public health: mobile phones - Fact sheet N°193". World Health Organization. October 2014. Retrieved 2 August 2016. ↑ "What is the minimum safe distance from the welding arc above which there is no risk of eye damage?". The Welding Institute (TWI Global). Retrieved 10 March 2014. ↑ Sliney DH (1994). "UV radiation ocular exposure dosimetry". Doc Ophthalmol. 88 (3–4): 243–54. doi:10.1007/bf01203678. PMID 7634993. ↑ Rafnsson, V; Olafsdottir E; Hrafnkelsson J; Sasaki H; Arnarsson A; Jonasson F (2005). "Cosmic radiation increases the risk of nuclear cataract in airline pilots: a population-based case-control study". Arch Ophthalmol. 123 (8): 1102–5. doi:10.1001/archopht.123.8.1102. PMID 16087845. ↑ Dobson, R. (2005). "Ozone depletion will bring big rise in number of cataracts". BMJ. 331 (7528): 1292–1295. doi:10.1136/bmj.331.7528.1292-d. PMC 1298891 . ↑ Komarnitsky. "Case study of ultraviolet vision after IOL removal for Cataract Surgery". ↑ "UV Exposure & Your Health". UV Awareness. Retrieved 10 March 2014.